Published: March 13, 2015 at 02:32 p.m. The NFL's free agency frenzy has been one wild ride, as numerous big-name players have changed addresses. That's resulted in a ton of fantasy implications, both for the players who are on the move and several incumbents who will see different roles with their current teams. Here's a look at the biggest winners and losers, and how their fantasy appeal has changed in the last week. 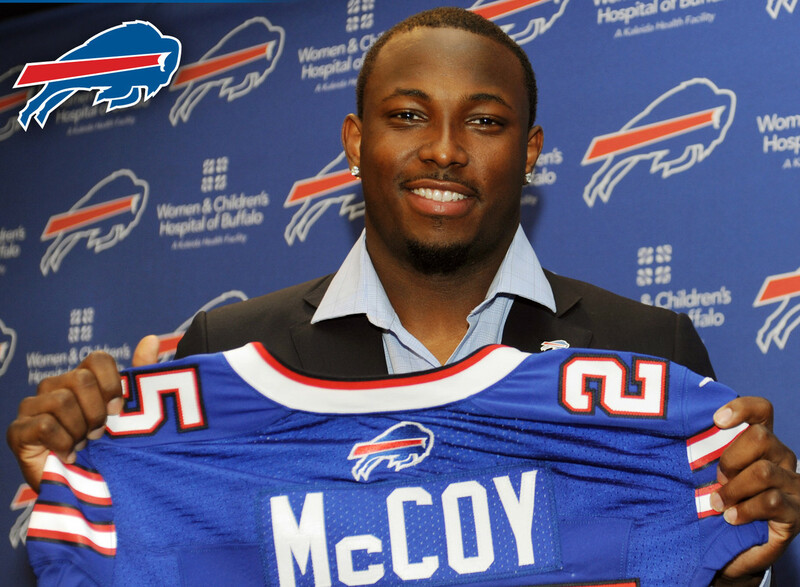 You might think McCoy is a fantasy loser because he left the system of former coach Chip Kelly, but that's not true. Now guaranteed to see right around 25 touches per game, the Pittsburgh product doesn't lose a lot of value. When you also consider how much new coach Rex Ryan loved to run the football while with the New York Jets and well, McCoy should have more than his share of opportunities to produce. Murray was the best running back in fantasy football last season, putting up 294.1 points on 449 touches. Now in Philadelphia, he's in a great system under coach Chip Kelly but has competition for touches in the form of Ryan Mathews and Darren Sproles. As a result, there's a good chance his touches and production will decline in 2015. He's also in danger of breaking down after such a huge 2014 workload. Ingram, who broke out in the stat sheets last season, will remain the top running back on a New Orleans offense that could run the football more after the trade that sent Jimmy Graham to Seattle. The Saints added a solid run blocker in center Max Unger in the deal too, making Ingram that much more attractive in fantasy land. He could push for No. 1 fantasy running back value and has second-round value. Graham is still ranked as the No. 2 tight end in fantasy football behind Rob Gronkowski, but his statistical ceiling comes down a bit with the Seahawks. That's because he's going from a team that recorded the second-most pass plays last season (690) to a Seattle squad that finished dead last (496) in that category. His days of putting up 1,200-plus yards and 15-plus touchdown catches could be over. The trade that sent Brandon Marshall to the New York Jets make Jeffery a surefire No. 1 fantasy wide receiver. The talented South Carolina product has been more than impressive at the pro level, putting up 80-plus catches with over 1,100 yards in each of the last two years and a combined 17 touchdowns during that span. Jeffery, who is also entering a contract year, will be in position to rank among the 10 best players at his position in 2015. Is the statistical cliff coming for Brees? His passing yards and touchdown totals have decreased in each of the last three seasons, and at 36 he's getting a little long in the tooth. The veteran out of Purdue will also be without his two of his top options in the pass attack, as the Saints traded Jimmy Graham to the Seattle Seahawks and Kenny Stills to the Miami Dolphins. Brees remains a top-five quarterback, but his best days could be in the rearview. The third-best player in fantasy football last season, Wilson's stock increased the second the Seahawks acquired Jimmy Graham from New Orleans. He now has a legitimate weapon in the pass attack for the first time at the pro level, and Graham's presence in the red zone should mean more touchdown passes for Wilson. The Wisconsin product has moved up and is now ranked third in my 2015 quarterback rankings. Over the last two seasons, Thomas scored 24 touchdowns. In that same time, the Jaguars pass-catchers have scored 29 times ... as a team! That's bad news for the veteran tight end, who will see a massive downgrade at the quarterback position from Peyton Manning to Blake Bortles. Thomas, who is destined to see fewer red-zone opportunities, can no longer be considered a top-five option at a weak fantasy position. Hyde showed some flashes of potential as a rookie, but now he's in line to become a far bigger part of the 49ers offense in 2015. With Frank Gore taking his talents to Indianapolis, the Ohio State product is now the favorite to open next season as the top runner for new coach Jim Tomsula. As long as the team doesn't bring in a major player to the backfield, Hyde should be considered a breakout candidate. A top-10 fantasy wideout last season, Maclin's value suffers now that he's in Kansas City. In 14 seasons as the head man in Philadelphia, Andy Reid's offenses failed to produce even one 1,000-yard wideout nine different times. Alex Smith is not the most accurate passer in the vertical attack, which also doesn't bode well for Maclin's prospects. He's now on the No. 2 fantasy wideout radar for 2015. Forsett left the "friend zone" and found a commitment with the Ravens on a three-year deal, which should keep him a valuable asset in fantasy land. In 2014, he broke out in the stat sheets and finished among the top-10 running backs based on total fantasy points. As long has he remains a featured runner next season, Forsett should have another strong campaign under new offensive coordinator Mark Trestman. Braylon Edwards. Santonio Holmes. Eric Decker. Percy Harvin. All four wideouts went to New York during their NFL careers, and all four failed to produce in the stat sheets. Marshall, once an elite fantasy wide receiver, could be next to join this undesirable list as a member of Gang Green. I do like his chances to produce more if Ryan Fitzpatrick is the starter, but Marshall's value has still taken a hit. The Texans released Andre Johnson, who went ahead and signed with another AFC South team in the Indianapolis Colts. That should be good for the value of Hopkins, who scored more fantasy points than A.J. last season despite seeing fewer targets. Entering his third NFL campaign and now the unquestioned first option in the pass attack for coach Bill O'Brien, Hopkins should be on the No. 2 wideout radar. Jennings was a productive fantasy option when healthy last season, but injuries kept him from meeting his statistical potential. With the addition of Shane Vereen and the presence of Andre Williams, his road block on the fantasy highway is a surefire three-headed committee. The NFC East now fields two of the more confusing and likely frustrating backfields in fantasy football heading into the 2015 campaign. The Falcons released Steven Jackson and didn't add a veteran running back in free agency, so Freeman's value is now on the rise. New offensive coordinator Kyle Shanahan is a self-proclaimed fan of the Florida State product, and general manager Thomas Dimitroff told the Falcons' official website that there's "no question" Freeman can be the team's featured back. He'll have a ton of chances to produce next season. RBBC ... it's one of the nastiest four-letter "words" in fantasy football, and Vereen finds himself right in the middle of one with the Giants. In a backfield that includes Rashad Jennings and Andre Williams, Vereen is very likely to see a drastic decline in carries. Vereen will have more value in PPR leagues because of his skills as a pass-catcher, but his stock in standard formats takes an obvious hit. Gore's fantasy value is far better with the Colts than it would have with the Philadelphia Eagles, as he'll have a chance to be more versatile in Pep Hamilton's offense. While the fact that he's entering his age-32 season is a cause for some concern, Gore hasn't looked like he's slowing down in recent years. Also, keep in mind that Ahmad Bradshaw was putting up great totals before getting hurt in 2014. The Eagles ran a total of 653 pass plays last season, while the Rams threw it just 562 times. That's one reason Foles landed on the losers list from a fantasy standpoint. He's also going to a system that won't be nearly as advantageous from a statistical perspective. Furthermore, Foles will see a drop in the talent level around him compared to what he could have had if the Eagles hadn't traded him away. Jimmy Graham has been traded to Seattle, Kenny Stills has been traded to Miami and Marques Colston is coming off one of his worst seasons in the stat sheets as a member of the Saints. Enter Cooks, who showed flashes of potential as a rookie and is almost a lock to see an increase in targets next season. In fact, the talented Oregon State product will have a chance to push for No. 2 fantasy wideout value in what could be a breakout campaign. Mathews was a winner for a few hours, at least until news broke that the Eagles would also be signing DeMarco Murray. Now the No. 2 runner in a likely backfield committee, Mathews is going to be unpredictable in the stat sheets. Furthermore, he's not likely to see 200 total touches in the offense (barring injuries). It's difficult to promote him as much more than a No. 3 or 4 fantasy runner next season. The Raiders did sign Roy Helu Jr., but their pursuit of DeMarco Murray proved to be futile. As a result, Latavius Murray looks like the favorite to start for new coach Jack Del Rio. While his receiving totals will be limited with Helu Jr. in the mix, Murray figures to be the lead back on early downs and in the red zone. There's potential to be had here, so Murray will be a breakout candidate. The addition of new offensive coordinator Marc Trestman is a real positive for Flacco's value, but who is he throwing the football to next season? The Ravens lost Torrey Smith to the San Francisco 49ers, and his top option at tight end, Dennis Pitta, is no lock to return from his second hip dislocation in two years. Baltimore needs to improve Flacco's weapons for him to meet his full potential next season. First it was reported that Cameron was returning to the Browns, then it came out that the Dolphins had won this tight-end sweepstakes. It's a positive move for the USC product, who will now be catching passes from Ryan Tannehill and not one of Cleveland's mediocre quarterbacks. Hopefully, Cameron can avoid the concussion issues that have plagued him during his career at the NFL level. Moncrief figures to be the No. 3 wide receiver on the depth chart in Indianapolis next season, which is a result of the team signing Andre Johnson. Had the team not inked the veteran, Moncrief would have been quite a nice fantasy sleeper candidate next season. Instead, the second-year receiver out of Mississippi will project to see more limited targets and will struggle to produce on a consistent basis. The Eagles have re-shaped their offense and will run the ball more often in 2015, but coach Chip Kelly won't ignore the pass attack. And with Jeremy Maclin headed to Kansas City, Matthews is next in line to be the team's top wide receiver. He showed flashes of potential as a rookie, and now he projects to see more targets from new quarterback Sam Bradford. Matthews has breakout appeal. Had the Packers lost Randall Cobb to the free-agent market, Adams would have been one of the most popular breakout wide receivers in fantasy football. Instead, he'll remain behind Cobb and Jordy Nelson in the team's passing game into the foreseeable future. Not only did Cobb's return hurt his seasonal appeal, but dynasty leaguers are also going to wait several years for him to earn a more prominent role. Daniels might be entering his age-33 season, but his fantasy value is still on the rise. With Julius Thomas now in Jacksonville, Daniels figures to be the top pass-catching option at tight end for new coach Gary Kubiak. The two have been together for years (Houston, Baltimore), so there's no learning curve. What's more, catching passes from Peyton Manning will do nothing but improve Daniels' value. A top-10 fantasy defense last season, the Patriots now have a lot of holes to fill. The departure of cornerback Darrelle Revis is a killer, and the release of cornerback Brandon Browner (Saints) and defensive lineman Vince Wilfork leaves the squad with big question marks. Coach Bill Belichick always gets the most of his players, but it's tough to argue that this unit's value has taken a downward turn. Tannehill is coming off the best season of his NFL career, posting 4,000-plus yards and his best fantasy points total at the NFL level. He could improve even further next season, as the Dolphins have added both Jordan Cameron and Kenny Stills in the pass attack to go with incumbent starter and breakout candidate Jarvis Landry. Tannehill now has some nice weapons and could push for No. 1 quarterback value. The last time the Jets had superstar cornerback Darrelle Revis paired with Antonio Cromartie in their defensive backfield was 2011. During that campaign, their defense surrendered a mere seven touchdown catches and the fourth-fewest fantasy points to opposing wide receivers. That's bad news for Sammy Watkins, Jarvis Landry and Julian Edelman, who now run the risk of being stranded on Revis Island twice a season.